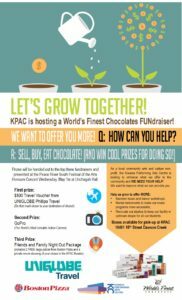 KPAC is hosting a World’s Finest Chocolates FUNdraiser to help grow how we help the community. As a local community arts and culture non-profit, the Kiwanis Performing Arts Centre is looking to enhance what we offer. Money raised from the fundraiser will go directly to providing more summer and dance workshops; rental instruments to make our music programs more accessible; and to help renovate our studios to keep our facility in optimum shape for all our students! As further incentive, prizes will be handed out to the top three fundraisers and presented at the Peace River South Festival of the Arts Honours Concert Wednesday, May 1st at Unchagah Hall. Prizes have been generously sponsored by Uniglobe Travel and Boston Pizza! Third Prize: Friends and Family Night Out Package (includes 2 large pizza from Boston Pizza and a private showing of a movie of your choice fro you, your friends and family in the KPAC theatre). Boxes are available for pick-up at the KPAC from office.